A gray morning breaks. I walk our land. Three and a half acres. Enough space for two septuagenarians to dwell in relative peace. The scent of wet earth revives me—winter’s damage strewn high and low, near and far. I start toward the garden steps to upright three small urns. No—keep focused. Hen chores first, then inspect our two new bluebird boxes. My friend Joyce handcrafted them for my birthday. A few weeks ago in a foot of snow, we secured them six feet above ground on two different posts that help support our vegetable garden’s deer-proof fence. “You can observe the bluebirds with your binoculars from the kitchen windows,” Joyce said. She claimed she heard a bluebird sing. I took her word for it. Someday, I’ll know the name of all our songbirds. It’s a matter of respect and praise. And I’ll know my trees. Good thing they don’t have a voice to ID. Well, in a way they do. Firs speak a different tongue than maples when the wind blows. I find happy hens and one messy house. One more thing to clean up, come a warm day. As I round the coup’s corner, peeling paint on the back door and under the eaves catch my eye. Can’t postpone that project another season. A Dawn Redwood tree close by calls my name. She models new lichen gems on her branches and stems. They’re perfectly symmetrical—green botanical wonders, “interwoven fungal filaments,” she boasts. I’m beside myself to stand again upon and amongst growing plants. I think the millionth time to change my vocation to one outdoors. Well, John Muir did both, I remind myself. Balance. Will I ever achieve it? 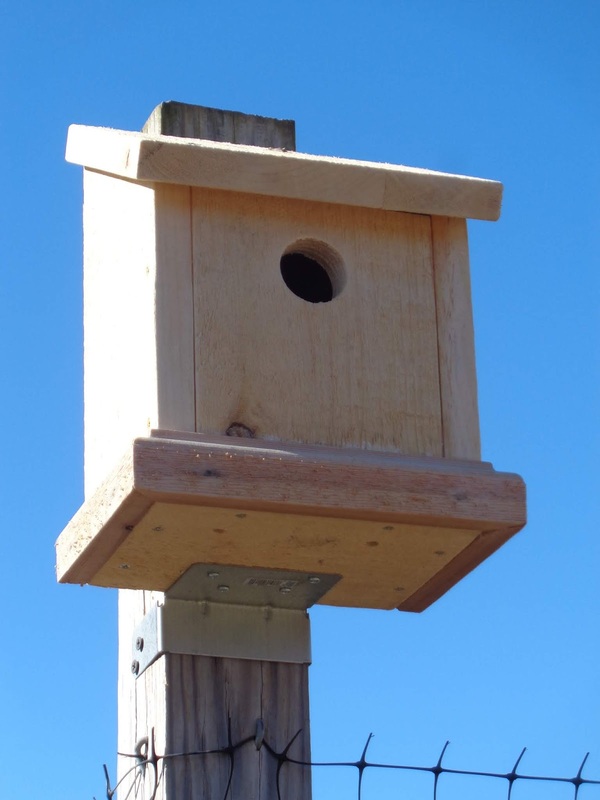 No activity around or in the bluebird boxes. The little entrance begs for company. On I go to three paw-paw trees. Bare sticks point upward with promise. ‘Would you hurry, please, before I lose my sense of taste for your mango-banana fruit?” I say. A downspout extension is blown loose from the pavilion again. A puddle of rainwater sits at the corner, a perfect wood-rot scenario. With a few grunts and exclamations, I rejoin the two parts and return my derrière to my desk to write the day away. By 3:30 p.m., I’m eager to walk when Mel drives us to the Polly Ann Trail in Leonard. “You won’t need that heavy jacket,” he says. A drizzle becomes a light shower as we turn at Bordman Road and aim toward our car. 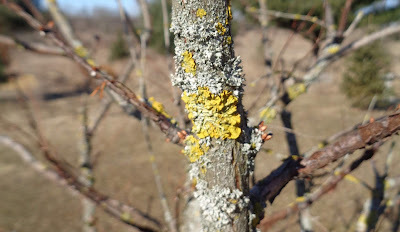 Sweaty and exhilarated, I kick lichen-mottled debris from our path. Dear Reader, I’d forgotten how pleasant a soft rain falls upon my face when burning up with spring fever. Soon, the grasses, gardens, and trees will unfurl their jewels of every color. Meanwhile, I stand at my kitchen window with binoculars, wait for blue wings. Their song in the spring sky.